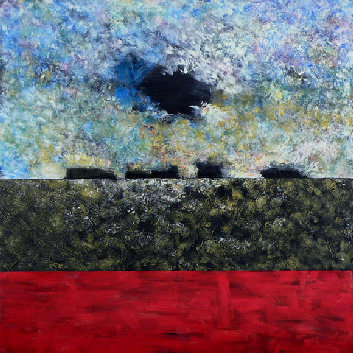 My current work is a combination of dusky, yet colorful pieces with landscape undertones. Although many of these works are commonly interpreted as landscapes, I don’t think of myself as a landscape painter. I’m more concerned with the composition, color, and mood of the piece than the specific subject matter. Rather than focusing on the more traditional landscape mainstays, such as trees and flowers, I prefer to break the scene down into its basic elements—earth, sky, water, and the occasional found object. Also, whereas most landscape paintings attempt to capture a specific moment in time, I consider most of these works to be composites of what one might see over a period of time—a combining of the colors and shapes that pass before us. Most of these “scenes” are set at twilight. The transition from day to night has a nebulous quality I find fascinating—there is beauty accompanied by darker undertones. The sun is gone. Distortion creeps in. Land merges into sky. Familiar objects dissolve. The day succumbs to night. Metaphorically, I have used the twilight (which I frequently refer to as “the gloaming”) as a metaphor to explore issues of transition, division, and duality. I tend to work within this broad concept and I don’t wish to be overly specific when assigning meaning to a particular piece. Ultimately, I hope these works will be enjoyed and that the viewer will find his or her own meaning within them. A native of Duncan, Oklahoman, Dean Wyatt is a self-taught artist who currently resides in Owasso. 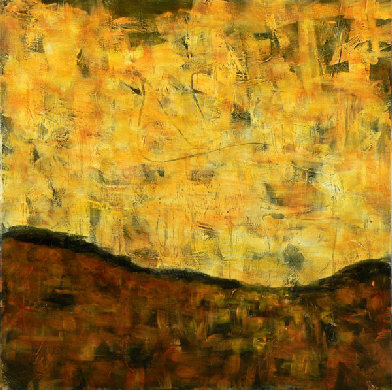 His multi-layered paintings are rich in color and texture and consist primarily of abstract or abstracted forms, which often imply landscapes or other elements of nature. Wyatt exhibits regularly in Tulsa galleries and serves on the boards of directors of the Tulsa Artists’ Coalition and the Tulsa Ballet. His work was selected for exhibition in both the highly competitive 2007 and 2005 OVAC Painting and Drawing Biennial exhibitions. In 2010, he had a solo exhibition in the Governor's Gallery at the Oklahoma State Capitol.